Nearly two years ago, I did a Bible Study here on the blog of the Proverbs 31 woman. I really enjoyed going through the study with y'all and learning all that I could. I thought this would be a great time to revisit the study and hopefully learn something new! Each Sunday we'll have a new post with a breakdown of a verse or two, until we make our way to the end. It's 12 weeks, finishing up right before Christmas. I’m so super excited to share this study with y'all. I have striven, for years, to serve God in every aspect of my lives. I've just always had this drawing to the Proverbs 31 woman and thought if I learned more about her, that would help me serve Him better. Seems to have it all together, doesn't she y'all? She blesses her husband, manages her home, plants vineyards, weaves cloth, helps the poor, travels to the ends of the earth for good food and apparently never sleeps. She also is dignified, optimistic about the future, always wise, and amazingly kind. I mean, it's not like she was busy or anything. In the meantime, here I am just muddling through. Trying to balance running kids, laundry, housework, meal prep, doctor appointments and family time. She seemed to just glide gracefully through her million things while I have a hard time juggling my few. I want everything to be perfect. Perfectly perfect. I want to have the perfect balance, perfect marriage, be a perfect parent and run a perfect household. I want to be the proverbs 31 woman. I want to do it all and be it all. Going through this study, I realized it's not about be “perfect.” It’s about living life with purpose, diligence, priorities, forgiveness and repentance. I have to say, Solomon is one of my favorite Bible authors. Song of Solomon is among my favorites as well, even having a tattoo of one of the verses on my back. So knowing that Solomon wrote Proverbs 31 made me super happy and made me want to learn more! Proverbs 31 is a beautiful poem of the characteristics of a virtuous woman and noble wife. While the book of Proverbs was written by Solomon but when we come to Chapter 31, there is a new voice. It’s a mother’s voice, telling her son what to look for in his life partner. It was Solomon writing the advice his mother, Bathsheba, had given him. Solomon wrote it using his pseudonym name, King Lemuel. It’s not just wisdom given from a mother to her son, it's God’s Word. It’s what we, as women, are to attain to. What we should strive to be. Let's read through it's entirely before beginning our study. This week we'll begin our study on verse 10. It begins with A wife of noble character who can find?The King James Version has this verse as Who can find a virtuous woman? So what would this wife of noble character look like? When we look up the definition of virtuous, it says having or showing high moral standards and chaste. The definition of noble says having dignity and elevation. So set your standards and morals high ladies. A virtuous woman is a crown to her husband: but she that maketh ashamed is as rottenness in his bones. The second part of verse 10 says She is worth far more than rubies. 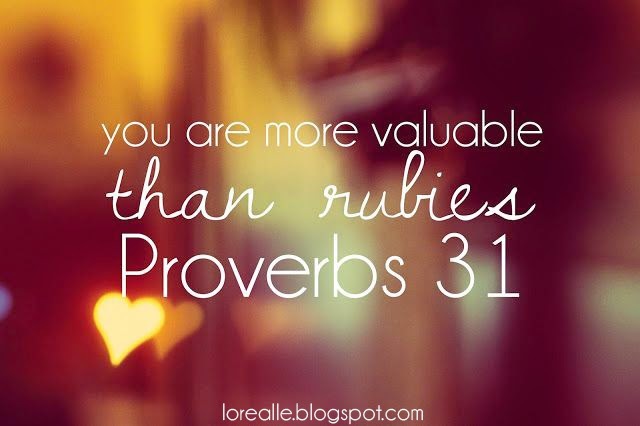 This virtuous woman is so rare that when you find her, she will be worth more to you than rubies. We are not called to be women of the world, who are very easy to find. We are to be rare and hard to find. God attaches a pretty high value to this rare, virtuous woman. Don’t get discouraged when you read all the Proverbs 31 woman accomplished. It's sure easy to do reading all that. But we need to remember these aren't things she did all in one day. This is what she completed over her lifetime. She drew all her strength from God and He enabled her. She fixed her eyes on Him and never looked elsewhere. Wow, what an amazing example for us to follow! While I was doing my study, I was searching around the internet and trying to learn all I could about this amazing lady. I was shocked at some of the opinions women had of her. I saw comments like "this passage is all about women being slaves to their household and that it's chauvinistic". I guess I shouldn't be shocked, we do live in a fallen world. But I've always saw the virtuous woman as this beautiful woman that I WANT to be. This chickie is far from a Proverbs 31 woman but it sure is my heart’s desire to be one. I believe if you love God and you want to be a Proverbs 31 woman, you absolutely can. But the only way to do that is by fixing your eyes on Him. Get in His word and read it. Spend time with Him. It’s going to take some time and there will definitely be some bumps in the road. There will be lots of heart work God will need to do on us to develop our noble and virtuous character. And those moments might be ouchie. He sure does love you right where you are but he doesn't want you to stay there, He has much better things planned for you. Come back next Sunday to continue our study on this amazing virtuous woman!